For SIGGRAPH, KDAB has been working on a new Qt 3D based demo. We decided that instead of using C++, it would be interesting to try out PySide2 and harness Python to drive the application. The idea behind this demo is to do with data acquisition of a vehicle’s surrounding environment. Once the data is acquired it can be processed and used to display a 3D scene. The application is structured in two main parts. On the one hand, we use QtQuick and the Qt 3D QML API to declare the UI and instantiate the 3D scene. On the other hand we use Python for the backend logic, data processing and models and definition of the custom Qt 3D meshes elements we’ll need to use in the UI. The information for these is obtained by looping around a generated set of road sections. 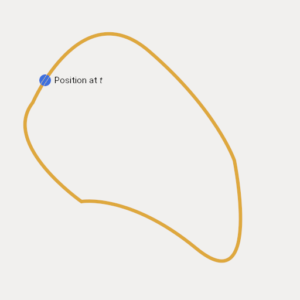 To define a fake road track, we’ve used cubic bezier curves, each bezier curve defining a road section. 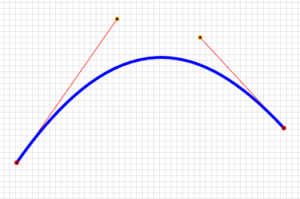 A cubic bezier curve is defined as 2 end points + 2 control points. This allows for a rather compact description of the road section we want our vehicle to travel on. Notice how each bezier curve starts at the position of the last point of the previous curve. That’s because we want no discontinuity between our road sections. On each curve, we sample 250 subdivisions to generate raw position data. Given we have 7 curves, that gives us a total of 1750 positions. In real life our vehicle is only aware of the immediately surrounding environment. In our case, we’ve decided that would be about 100 positions in front of the vehicle and 50 positions at the rear. Every 16ms, we increase a global index (which goes from 0 to 1750) and select 150 entries starting at our index. From these 150 positions we extrude 4 lines (to make 3 road lanes). The 50th entry we’ve selected is where we assume our vehicle is. In the 3D view we assume the vehicle is placed in (0, 0, 0). The camera is placed slightly behind the vehicle, its view center being the vehicle. So if positions is where our vehicle actually is in the real world, we actually need to translate back all our positions to minus positions. We also want our vehicle and our camera to rotate as we are going along curves. For that we know that our camera is looking toward -Z (0, 0, -1). 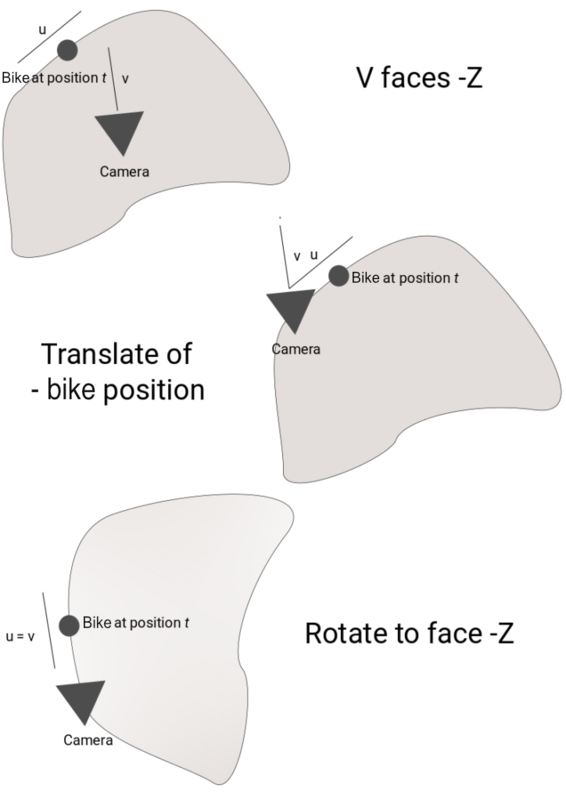 We can compute a vector u (vehicle position – road section start) and then find the angle between u and -z using the dot product. Then, it’s just a matter of transforming all these positions using the transformation matrix. To render the road lines, we have created a new Qt 3D QGeometry subclass. The python backend generates new buffer data for the road every frame, based on the 150 transformed positions that have been computed. Basically for each 2 positions, a quad made up of 2 triangles is generated to make up one part of a road line. This process is repeated 4 times with an offset on the x-axis for each road line. In turn, this is repeated 150 times so that we have quads for each position and for each line to make up our 3 road lanes. We just upload these buffers to the GPU by using a Qt 3D QBuffer and setting its data property. Note: in Python the QGeometry::geometryFactory API is unavailable, meaning that we need to update directly our QBuffer data in the frontend. A first pass is rendered into a texture. An input texture is then used as a base for a multi pass gaussian blur. The fragment color is summed up with the previous blur output which ends up creating a Bloom Effect. The Tron-like appearance is simply a result of this FrameGraph Bloom effect. 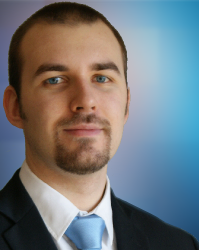 What about PySide2 and Qt 3D? Some odd behaviors and queue invocations (variable having to be printed for some changes to be take into account). Overall it was an enjoyable experience and with the bindings, Python is a real alternative to C++ for most of what regular users might wish to do with Qt 3D. You can download Qt for Python here. Impressive work ! Could you upload the video file for this? “Using this tool, we generated the bezier curves with these values:”. I may have missed something but what dd you use for this ?